You don't always need words to express yourself. Try saying what's on your mind with our Sweet Memories Bouquet. 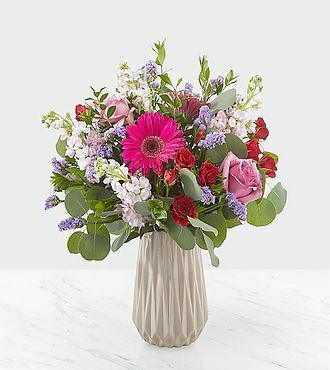 Comprised of gorgeous gerbera daisies, multi-hued roses, stock, myrtle and statice, this stunning bouquet is sure to deliver a loving message the recipient will never forget. STANDARD bouquet is approx. 18H x 14W. DELUXE bouquet is approx. 19H x 16W. PREMIUM bouquet is approx. 20H x 17W.